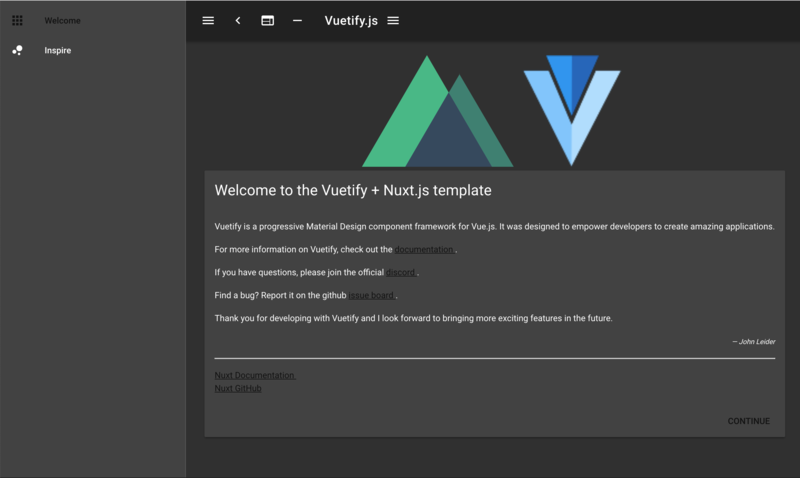 Simply run yarn create nuxt-app project and choose Eslint in the process. No need for a reproducible link in this case, I think. Links have dark color that almost blends with the background color. Basically deafult colors are poor contrast-wise. Arrow keys move a single option up or down in the menus. Arrow keys move two options up or down in the menus. If i'm using create-nuxt-app it generated always an app with nuxt version 1.0.0 in the package.json. The creation process of a new nuxt project is not finishing. npm WARN [email protected] requires a peer of [email protected] - 3 but none is installed. You must install peer dependencies yourself. npm WARN [email protected] requires a peer of [email protected]^6.0.0 but none is installed. You must install peer dependencies yourself. npm WARN [email protected] requires a peer of [email protected]^3.18.0 || ^4.0.0 but none is installed. You must install peer dependencies yourself. Has anyone successfully programmatically called create-nuxt-app or used shelljs to successfully open create-nuxt-app without blocking inputs from the end user? I'm trying to see if I can either execute the create-nuxt-app as part of a step within a multi-step tool that does some other custom tasks. I'm relying on shelljs ( https://github.com/shelljs/shelljs ) to execute my commands from node, however I run into an issue where my custom CLI freezes up when I execute the create-nuxt-app cli. If this isn't feasible, then I was hoping I could programmatically provide inputs to the create-nuxt-app cli (--name 'project-name', --description 'my-description', etc, etc). However after looking at docs and source code I'm not seeing a way to do this. 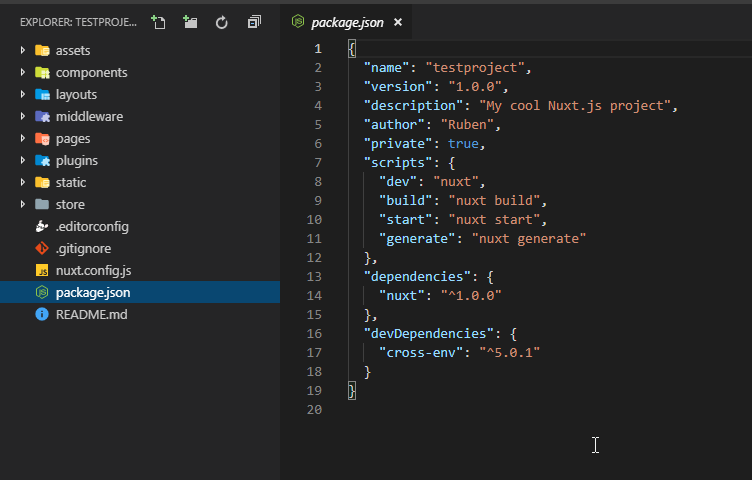 and added config.devtool = "eval-source-map"; to build.extend in nuxt.config.js. Node process is started via yarn dev before starting debugging in VS Code. A set breakpoint is shown as Unverified breakpoint in VS Code or sometimes moves from e.g. asyncData to a line within <template>. How to make VS Code breakpoints work in single file components (layouts, pages and components folders)? Every time I run npx create-nuxt-app <project-name> --edge Nuxt 1.0 is being installed? How can I use typescript for Vuex files (store/index.js => store/index.ts)? I use TypeScript syntax in .vue files(Components), and I also want to use TypeScript syntax for store files. If I just rename the files into .ts, the store becomes invisible for components. 1 error and 0 warnings potentially fixable with the --fix option. Seems like a linting / prettier error. I setup using default setting and Bulma as the UI framework. Have tested this a few times with no luck. 2 errors and 0 warnings potentially fixable with the --fix option. Then, CLI asks for a project name, description etc… If project name is invalid, CLI doesn't handle it, but project can't be run with npm run dev. 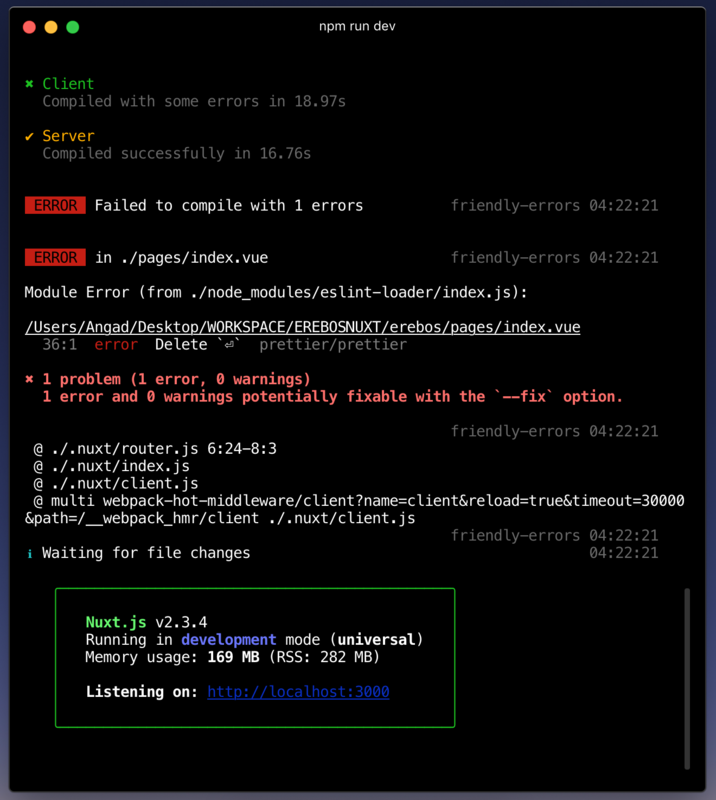 $ npm run dev npm ERR! Invalid name: "Hugo Torzuoli"
Nothing during CLI steps, error when serving app. I think it would be great to extend the available options for UI frameworks. those deps depending on the selection. cross-env (deps) and nodemon (devDeps) are not needed for every project. We should properly guard them as well.